What number of times have you tried making a delicious and sumptuous meal, but only to be held back from cooking because your oven has gone haywire on you? It is not always that obvious when ovens begin to go on a blink. If your food stops cooking altogether, then it becomes quite clear that there is a problem in your oven but, on the other hand, if your food simply takes longer time to cook it does not clearly indicate a problem in the appliance. You can expect 7-10 years of excellent performance from an oven but you will able to extend this if you get in touch with a repair shop at the first sign of trouble. Minor faults such as broken seal or Door not closing properly will put more wear on your oven and cause it to fail sooner so it is always cheaper to get these issues rectified. The oven repair technicians at Local Appliance Repairs in Sydney can help you get your malfunctioning or troublesome oven back to its optimum performance!! The most important Safety Advice to note is “Never use your Oven in your absence” and make sure that the Orange light goes off when it has reached its temperature. Also having a Trip switch or an ELCB instead of an Old Ceramic fuse in your meter box is an important safety feature. If you still have a fuse, it is highly recommended that you call an electrician and get it upgraded to a “Trip Switch or an ELCB” Lastly make sure your Smoke alarm is located in your kitchen at a reasonable distance from your cooking appliances. So, whether you are an avid cook, or if your oven only gets used during the holidays, it is an important appliance that takes up a special place in your kitchen and so, when your oven stops working, you should take immediate action to fix it before it becomes a major issue. 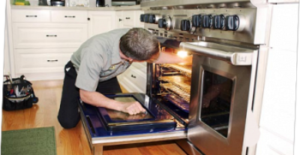 Hiring a professional is the best choice for you to make, when it is about fixing a troublesome oven. In most cases, an oven is found to have three types of problems in common. 1. No Heat or Not Regulating the Temperature– Whether your oven has stopped heating altogether, or if it is not heating evenly, there are several things that could be the cause. Hiring a professional gives you the opportunity to take a safe step back while they check the elements, Thermostat, electrical circuits, fans and any other items that may be causing your oven not to work properly. You will feel more secure knowing that an experienced professional has resolved the problem. 2. Fan Noisy or Not Working- It often happens that the oven fan generates a lot of noise while working or operates very slowly than it usually does. The oven light is on and even though the elements get red hot, the heat is not sufficient. This is indicative to oven fan motor problem and an immediate replacement of the same. The oven fan motor plays an essential role than you may probably even know. It keeps the oven cavity evenly hot. So, if your fan oven is noisy, and you probably don’t know what to do, it is a good idea to hire a professional oven repair engineer to get it fixed or repaired. The oven repair technician will check whether the fan blade is loose as it is the possible cause of fan’s strange sounds and inefficiency and also properly evaluate whether the fan motor needs a replacement. Whatever the issue might be, seeking the assistance of a professional is probably the best idea. 3. Turns off after heating up– Often happens that the oven heats up and then shuts down. This problem is a critical issue and is often indicative to problem in the oven control board. 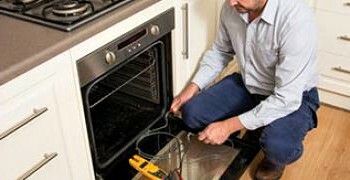 It is always the ideal decision to approach a professional oven repair technician, who can diagnose the problem due to what this happens and fix it in the best possible manner. Handing over the task to the professionals ensure that the appliance will get fixed and work well. At Local Appliance Repairs in Sydney be assured that the highly trained and knowledgeable technicians provide you with the very best and excellent customer care in fixing your oven. With Local Appliance Repairs your search for oven repairs in Sydney ends. They provide service around Sydney that includes Eastern Sydney, Ryde, Lower North Shore, Parramatta, Upper North Shore, Inner west, etc. They provide oven repair assistance for all top brands like Smeg, ILVE, Bosch, Whirlpool, Omega, Blanco, etc. If you find that the Cooling fan in your Westinghouse Smeg or ILVE oven is not working and also it heats up on the outside, then consider seeking assistance from the technicians of Local Appliance Repairs. They offer excellent Westinghouse oven repairs in Sydney and its surrounding area. So, why just choose Local Appliance Repairs when there are so many other oven repair service providers in Sydney? Local Appliance Repairs in Sydney is the leading appliance service specialist. All the technicians have more than 27 years of experience. This business provides service to residents of Sydney and its surrounding suburbs with experienced, quality and expert repairs. The technicians are not only experts at taking care of home appliances, but also in taking care of customers. The technicians of Local Appliance Repairs in Sydney are professional customer service representatives, who respect the needs of their clients. All the technicians are qualified and insured for your peace of mind. The services provided by this business include the following: oven repairs, cooktop repairs, dishwasher repairs, washing-machine repairs, dryer repairs and refrigerator repairs. So, if you need home appliance repairs in Sydney, you may contact the experienced technicians at Local Appliance Repairs!! By farrokh| 2018-01-11T14:40:21+00:00	January 2nd, 2018|Appliance Repairs|Comments Off on Facing Problems with Your Smeg, ILVE, Blanco or Westinghouse Oven at Home? No Worries!! Call the Expert Technicians of Local Appliance Repairs in Sydney! !